In spring, Yosemite is filled with the sound of rushing water, from magnificent waterfalls, to playful river rapids. These beautiful waterways look cool and refreshing, and can also be dangerous and even fatal. 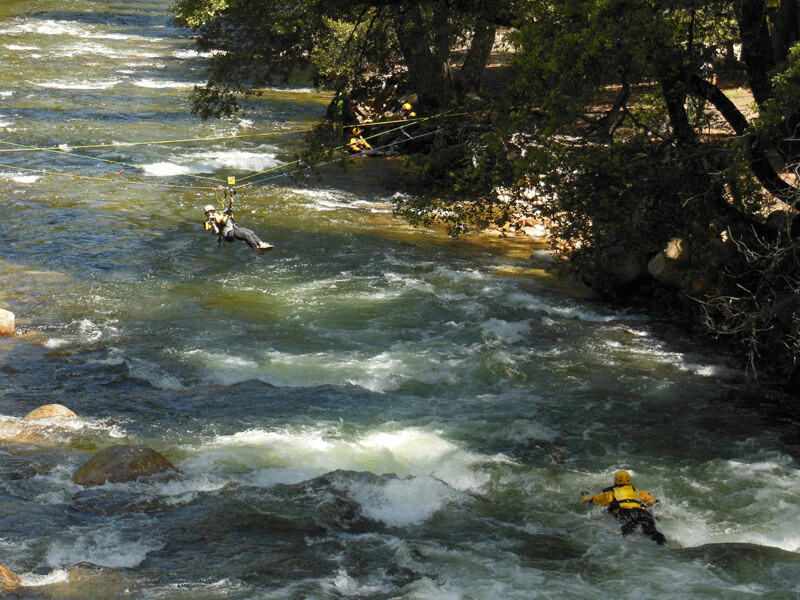 Today, the National Park Service hosted a special demonstration of swift water rescue techniques in the Merced River near Happy Isles. Even though it was a relatively dry winter season, the waterfalls and rivers are still deceptively powerful. 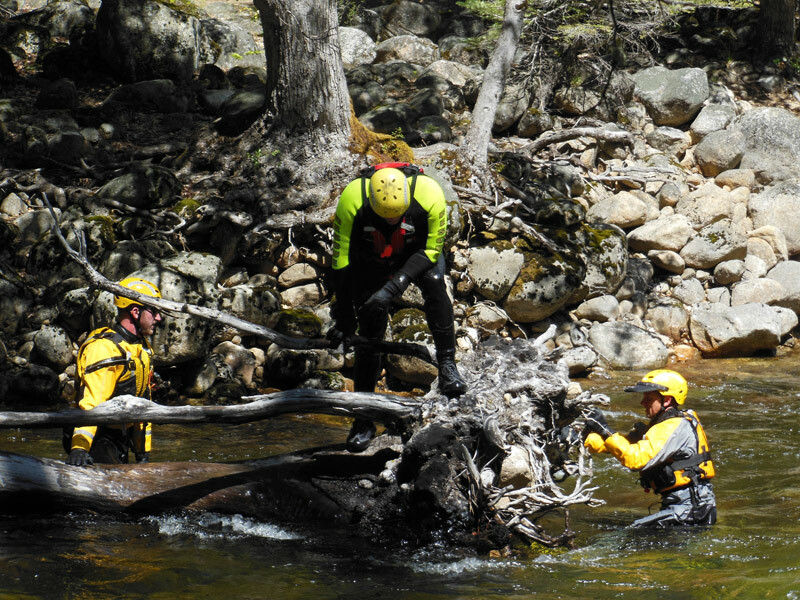 In fact, with the strength of the spring flow and cold water temperatures, a rescue situation can quickly become a body retrieval. Here rescuers demonstrate one technique where the rescuer has a safety line to the shore and swims out to the victim. Notice here that both people are in the right position for running rapids, with their feet high and downstream to protect them from rocks and other obstacles in the water. Downed trees in a river can be an additional hazard because water flows through them and can pin someone underwater on their upstream side. Rescuers call these hazards ‘strainers’. Rescuers demonstrate the precautions they need to take when searching around this fallen tree. 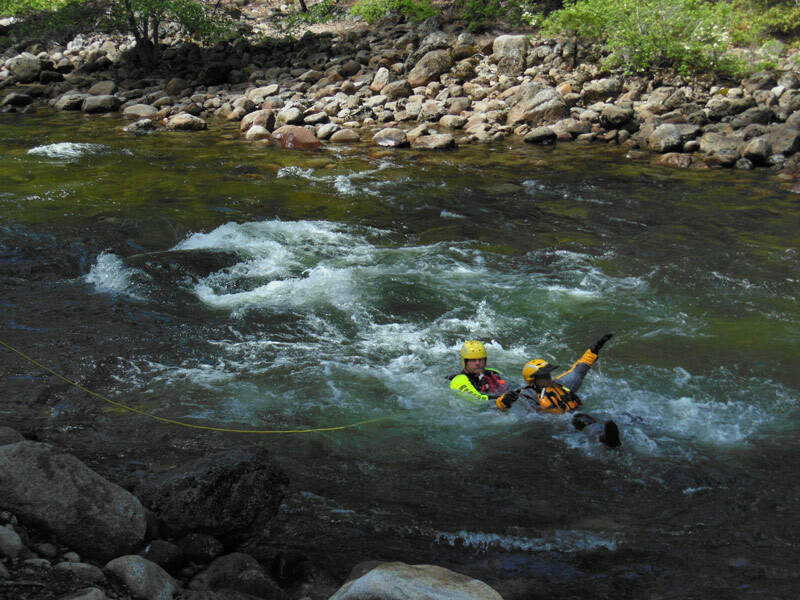 Rescuers often rig elaborate high lines so that a rescuer can safely get out over the water to pull someone out. Today, members of the press were given an opportunity to get a bird’s-eye view of the search and rescue team in the water. Many people are required to manage a high line safely. 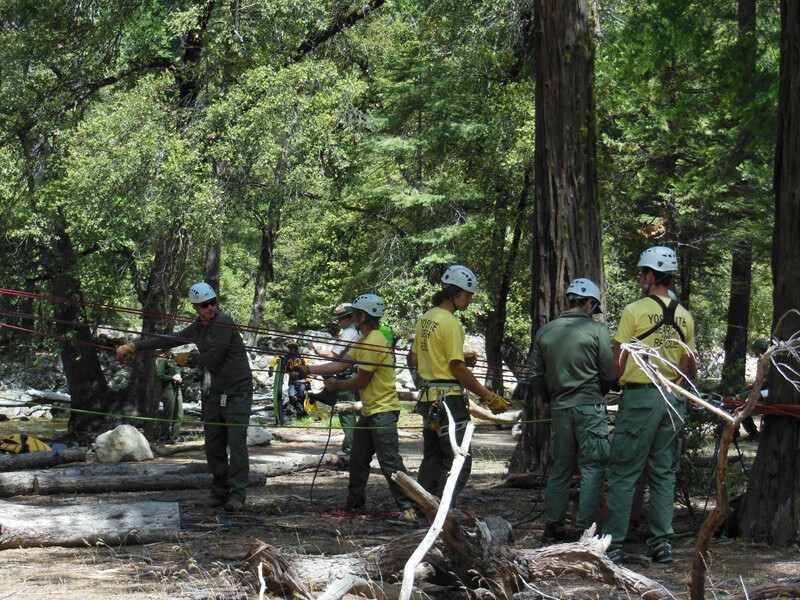 Thanks again to everyone on the Yosemite Search and Rescue team! Finally, if you think it can’t happen to you, take a few minutes to watch this sobering video. Yosemite is a magical, refreshing and renewing place. We hope you enjoy your visit safely! 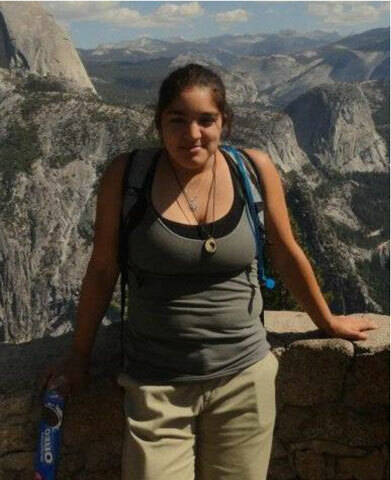 Yosemite Search and Rescue located missing employee, Jessica Garcia, in the early afternoon on October 9 after she had been missing for two days. Although injured, Garcia is alive, and has been transported to a local hospital for medical evaluation. She was found less than two miles up the South Fork of the Merced River in the southern portion of the park near Wawona where she was scheduled to begin working on Sunday. Approximately 50 people were involved in the Search and Rescue operation, including six dog teams, 15 ground searchers, a mounted Park Ranger, a helicopter crew and many others. Many thanks to all of the people who contributed to this happy ending.